Every year, thousands of volunteers put in countless hours of work to help make the annual Drum Corps International Tour possible. From driving vehicles to selling merchandise, altering uniforms to treating minor injuries, volunteers provide many services that are necessary for a successful and exciting summer experience. Since 1988, Drum Corps International, with the help of members of the Friends of DCI program, have been honoring faithful volunteers of the drum corps community for their time, effort and dedication. Nominated by corps staff members and directors, award recipients are selected by a panel of active Friends members. Helen Turner has been keeping the Cavaliers healthy as a volunteer nurse for 29 years during the corps' pre-season rehearsal camps and on the road in the summer. Helen provides first aid and nursing care to marching members and staff, orders medical and first aid supplies for the corps, schedules other nurse volunteers and teaches CPR to corps staff members. "Because of Helen's nursing program, young men with health conditions such as diabetes, allergies, asthma and seizures have been able to safely participate in the drum corps activity," said Bruno Zuccala, director of the Cavaliers. "When most volunteers her age are pursuing tamer activities, she is traveling the entire summer with the corps." 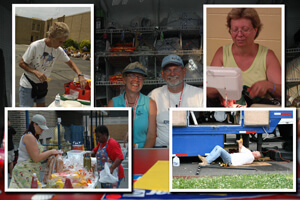 Tom and Linda have become a distinguished duo in the drum corps community as volunteers for the Cadets and the Raiders. Linda works with the kitchen crew preparing meals or tending to members who are ill or injured. Thanks to Tom's craftsmanship, the Cadets' equipment truck and RV trailers have been updated and redesigned. Always dedicated to the cause, they even keep scaffolding in their driveway for corps repair projects. "Tom and Linda are the epitome of what a volunteer should be," said George Hopkins, director of the Cadets. "They constantly concern themselves with the needs of the youth and the organizations they serve." Working for a drum corps can be a full-time job for many, but it's a year-round volunteer commitment for the Crossmen's Denise Troyer. After resigning from previous employment, Denise fills her time by volunteering for the Crossmen, helping with administrative duties 30 hours a week. She has excelled with record keeping by creating and maintaining a member database and tracking organization development efforts, while also contributing countless hours to fundraising, uniform sewing, and food serving, among a wide variety of other tasks. With each of the many roles she fulfills, Denise always takes a genuine interest in the care of each corps member. "It is rare to find someone who gives so freely and selflessly of themselves, especially for no compensation," said Crossmen director Mark Chambers. "Denise has truly been a blessing to our corps." This year's Volunteers of the Year will be honored at the 2009 Drum Corps International World Championships this August in Indianapolis, Ind.